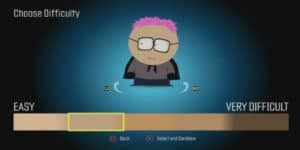 In South Park: The Fractured but Whole, Your Difficulty Level Determines Your Race | Nerd Much? Matt Stone and Trey Parker strike again. 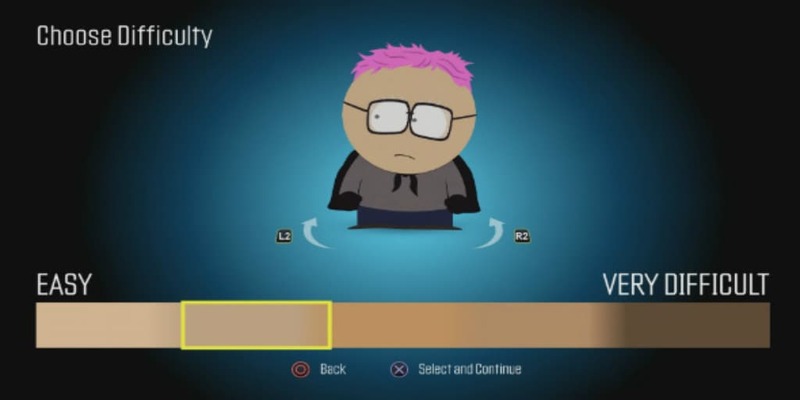 In what can only be described as an incredibly blunt and forceful use of social commentary, South Park: The Fractured but Whole doesn’t allow you to pick a race for your character. Instead, it changes the color of your skin based upon the difficulty level you choose in game. While creating your character within the prologue of the game, you’re tasked with choosing what difficulty level you would like to play at. As you adjust the slider from ‘Easy’ to ‘Very Difficult’, your skin color adjusts with it from white to black. As you can see from the image above, the darker your skin, the harder you’re choosing things to be for yourself. The process is met with dialogue from Eric Cartman, of course. “Don’t worry” he says, “this doesn’t affect combat. Just every other aspect of your whole life.” What it actually affects, according to Ubisoft, is the amount of money you’ll have in the game and the way in which other characters react to you. One thing is for sure, and in just the early stages of the game – South Park: The Fractured but Whole doesn’t pull any punches. And nor would we want it to. The game releases for PlayStation 4, Xbox One and PC on October 17th.